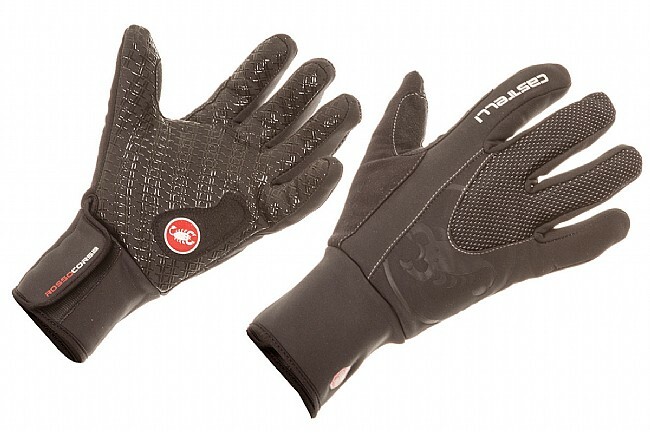 Keep your hands warm on the coldest rides with Castelli's Men's Estremo Gloves. Constructed out of Windstopper® X-Fast fabric to protect from wind and rain, these gloves then add a fleece liner for warmth (Castelli rates them from 23° to 40° F). For improved grip and durability the Estremos receive a silicone print over the palm. A Velcro closure on the Neoprene cuff seals off your hands from the elements. The Men's Estremo Glove is available in Black. Having done several rides that started in 18F and ended in the high 20s, these gloves will keep you warm. Does a wonderful job of keeping the winds in check. After 5 miles any sweat from your hands are wisks away keeping your hands dry. I got a medium. It is snug to the fit and the overall size is bulky but flexible enough that I never lost any feel for the brakes even on the drop. My hands are always cold so its hard to find the perfect winter riding glove. I dont like lobster claws and these work reasonably well for me down to about 30 - or lower if the ride is not too long. I ordered a size up and wear silk liners. That is the best combo for warmth and dexterity that I have found These are my second pair. Great wrist coverage and pretty good fit for me. They are tight on the end of my thumbs, but so are all my gloves and mittens. My thumb tips get cold pretty much no matter what. I've used these with temps as low as 30F and am satisfied with them. Little grippy features on the palm side is nice and reflective accents, too. While I don't believe anyone will ever create the perfect winter glove, these have proved to be better than many in my arsenal. I have worn these comfortably down to the freezing mark, below that I would add a wool liner or switch to a lobster claw. Above 45F (7C) I would go with something lighter. These feel solid and well-made and the long cuffs prevent gaps and help keep the cold out. Fairly warm gloves and good wind blockage. Good gloves. The velcro tab is a little hard to manipulate with the gloves on. In extreme cold you might need to put on some thin liners in addition to these gloves. In respect to appearance, these gloves look nice and of excellent quality. These are marketed as very warm gloves on the coldest rides. I think Castelli needs to clarify what they interpret by the coldest rides. If you are talking about 40 degree temps these work okay. If you are talking about anything colder, recommend you look elsewhere. They are well made, but not overly warm. Warm and cover the wrists very well, but the right thumb is short - weird. The early morning temps on my commutes the past two weeks have been in the twenties and even in the teens. Nothing keeps my numbs . . . I mean my thumbs warm. However, these are really nice gloves. Wrist coverage can be a problem for my long arms in riding position, but these provide enough coverage. I like everything about them except that the right thumb is annoyingly short and I feel like the web between thumb and forefinger is restricted therefore when reaching for the brake. It's an annoyance I'll probably tolerate until they wear out. Very warm and fit is excellent. Costello gloves fit my hands really well. I wear a medium and other brands tend to be just a little big and small are to tight. Costello are perfect. I have bought a few gloves for winter and always find my fingertips still get frosty. These gloves are warm and as far as being bulky, no worse than any other winter glove. I ride a Di2 bike and have a great feel for the shifting and am able to use my Garmin remote mounted on the inside of my hood as well with no problems. These were pricey but in terms of effectiveness and fit, I have already spent twice that on competitors gloves with less than favorable results. Costello is really becoming a brand I can trust for fit and quality. These are worth a look if your hands get cold with other gloves. I wanted a glove that would keep my hands warm and protected from the wind. I do not ride in icesnow but hands get cold in below 45 degree weather. This glove worked very well even in windy conditions. You lose some dexterity but I was able to shift and brake with little effort. I have the XL and my only complaint is the fingers could be a bit longer. Overall the construction and fabric is good. I love them thick warm supple and very comfortable! I ride with a death grip on my handlebars and these do me nicely comfort in the cold without Popsicle fingers! I live and ride in Minnesota, so that hopefully gives me some crediblity when talking about gloves for cold weather riding. I ride year round and do so until the temps drop to -10F. Deep winter riding is on a fatbike. I ride my road bike from late March until the ground freezes up permanently in December. These are awesome gloves for sub 40F riding. Great dexterity, great breathability. I rode these on my road bike until the ground froze (many sub 30F rides). Then I rode them all winter on my fatbike inside of some pogies down until about 0F. They worked great and higly recommended. Above 40-45F they are too warm, There, use Catelli's Legenda gloves (also Rossa Corsa grade). Those two gloves will get youy through just about anything and are amazing. I bought these gloves for winter commuting in Chicago. I have worn then down to the lower teens, very comfortable and warm. They are bit pricey but they are the right balance between warmth and bulk, they are very light and have good grip. The extended cuff works great keeping wind out of my sleeves. Definitely wind proof, plenty of Chicago wind to test that. The only thing I would like to see improved is to make the fingertips compatible with touchscreens. Ive used these on three, 3-hour rides in temps from 25-45F and they have worked perfectly. Not too bulky for di2 shifting, and plenty warm. Very grippy palms and fingers. Great balance between insulation and breathability. Not touchscreen compatible. Sizing runs true. I've used Craft Siberians for years, gone through several pairs. But as their warmth and quality/durability has declined, I gave these a try. I am well satisfied with their construction and I'm really happy with their warmth! Riding in Michigan Winter is not only cold- it's wet, too. These gloves handle both better than any I've had. Two hours in a 34 degree mist/sleet/snow last Sunday and my hands were fine. Proof, pudding, etc. Worth the extra money 'cuz they let me ride. Only gripe is that the thumbs are too long; rest of the fit is nice and snug. Just purchased these gloves and have worn them four times in mid 30-40 F temps. Nice and warm for my usually cold blooded hands. I have trouble finding any gloves that can keep my hands warm, so I usually use mittens. I am pleased I purchased these gloves! I have even used them on my moped with great results. Things I would change would be to make a tab to help open the very aggressive Velcro. Also, remove the scorpion sticker from the palm since it is slippery on the handlebars. And if the liners are not sewn into the glove, I would make them so since the liners tend to stick to sweaty hands and want to pull out of the glove when I remove my hand. The men's medium fit my hand well. I usually wear women's size large gloves. Highly recommend these for those with always cold hands. Really warm gloves for how thin they are. I ordered my standard size and they fit perfectly. A couple of damp rides in the low 40's and these performed flawlessly. Up into the low 50's they get really warm however. The only downside is how tacky they are against my lizard skins dsp tape. Sliding your hands is a no go, you need to release your grip completely in order to reposition. Not as good as it's been rated. Let me preface with the fact that I'm the type of person who gets cold fairly easy. When I saw these gloves rated for 23 - 40, I thought I give them a try. Unfortunately, it does work that well for me. My finger feels cold riding in any temperature below 45. I've used mittens in the past and it seems to work better than gloves. Also, with mittens, I can put in hand warmers to provide direct heat to my fingers. Like most good gear these are pricey but they have solved my freezing fingertip problem as well as not being to tight or loose. I like the fit and these appear to be very well crafted. I'm a huge fan of Castelli and these did not let me down. I have avoided colder riding because of glove issues and these have solved those problems. I do not like riding in the cold so I needed a pair of gloves that would keep me warm. They are a little bulky but I was able to shift and brake without a problem. Texting not so much.